Western blot analysis of whole cell lysates probed with BTRC antibody followed by detection with HRP conjugated Goat anti Mouse IgG (1/50,000, STAR207P) and visualized on the ChemiDoc MP with 6 second exposure. Arrow points to BTRC (molecular weight 55 kDa). BTRC antibody recognizes BTRC, also known as E3RSIkappaB or F-box and WD repeats protein. Mouse anti Human BTRC antibody recognizes BTRC, also known as E3RSIkappaB or F-box and WD repeats protein. BTRC encodes a member of the F-box protein family which is characterized by an approximately 40 amino acid motif, the F-box. The F-box proteins constitute one of the four subunits of ubiquitin protein ligase complex called SCFs (SKP1-cullin-F-box), which function in phosphorylation-dependent ubiquitination. The F-box proteins are divided into 3 classes: Fbws containing WD-40 domains, Fbls containing leucine-rich repeats, and Fbxs containing either different protein-protein interaction modules or no recognizable motifs. The protein encoded by BTRC belongs to the Fbws class; in addition to an F-box, this protein contains multiple WD-40 repeats. The encoded protein mediates degradation of CD4 via its interaction with HIV-1 Vpu. It has also been shown to ubiquitinate phosphorylated NFKBIA (nuclear factor of kappa light polypeptide gene enhancer in B-cells inhibitor, alpha), targeting it for degradation and thus activating nuclear factor kappa-B. Alternatively spliced transcript variants have been described. A related pseudogene exists in chromosome 6 (provided by RefSeq, Mar 2012). 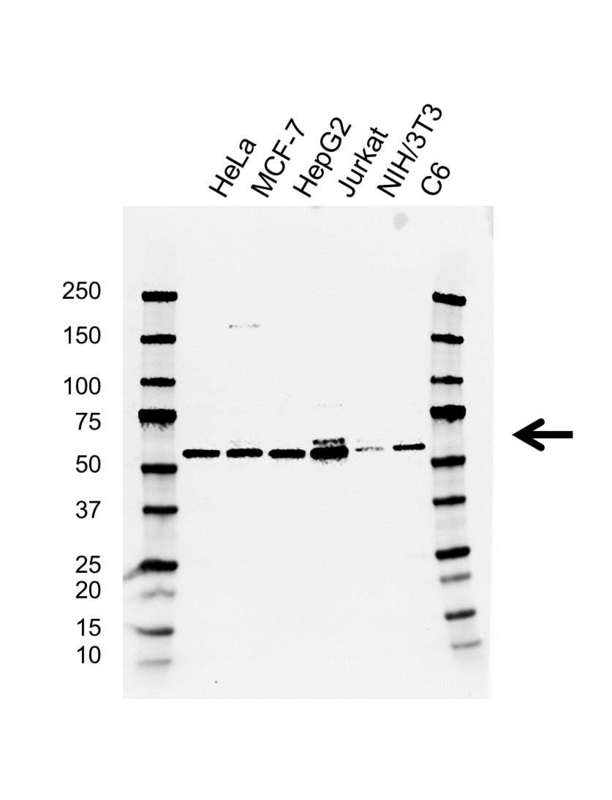 Mouse anti Human BTRC antibody detects a band of 55 kDa. The antibody has been extensively validated for western blotting using whole cell lysates.